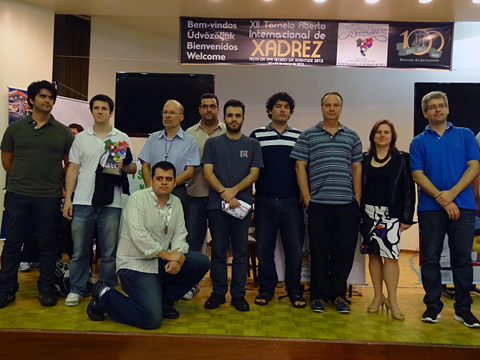 3/11/2012 – The final phase of the Festa da Uva chess activities was the much awaited Rapid Open, which took place over two days, and was a thoroughly grueling event. The open included the four players from the invitational event and followed a very unorthodox time-control scheme. 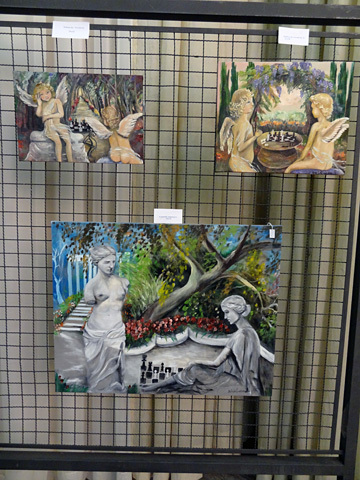 The top place was won by Gilberto Milos. 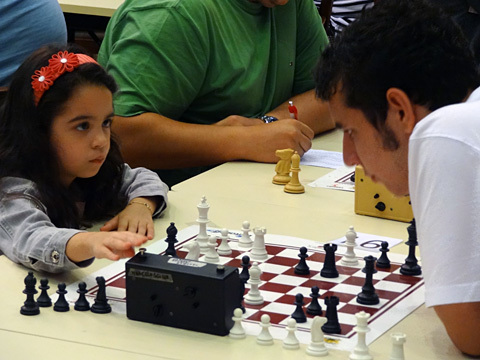 Updated with reader feedback and the complete Polgar-Mecking games. 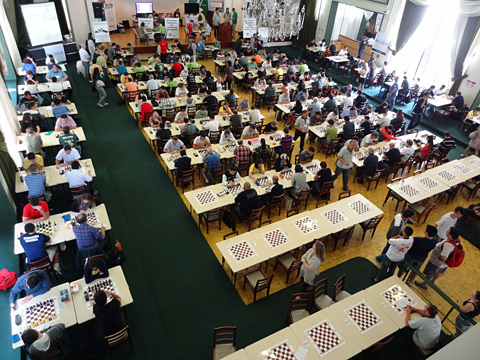 The final phase of the Festa da Uva chess activities, was the much awaited Rapid Open, which took place over two days, and was a thoroughly grueling event. The open not only had proper prizes with roughly US$3000 for first, but included the four players from the invitational from two days before. 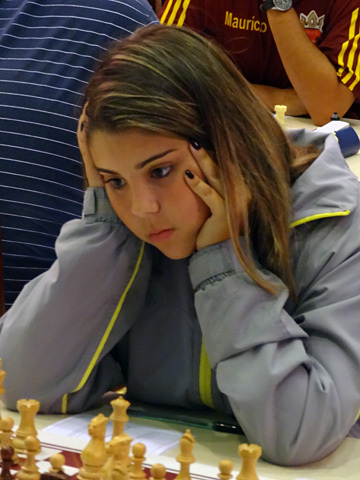 This also meant that Polgar, Milos, Mecking and Rodriguez had no time to rest, and doubly so for Judit considering her incredibly hectic schedule which kept her busy every day until past 11 PM. Let me register a well-deserved congratulations to Albert. 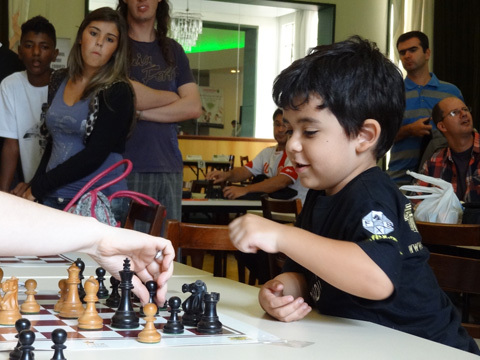 It is nice to see more and more good chess reports from Brazil. (...) This festival is more than a grape celebration from a regional center of grape and wine production. It also puts in evidence the Italian roots from the immigrants who occupied the region during the second half of 19th century. It should be noted that characters pictured in the report use the Italian flag colours in their dresses. 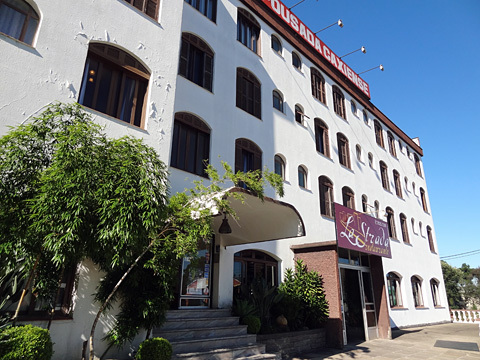 In some sense, Festa da Uva tells half of the story, while the other half is told by Oktoberfest, celebrated in other South Brazilian city, Santa Cruz do Sul. As one may expect, Oktoberfest is a German roots festival celebrating the immigration occurred from 1824 and WWII. The festivities remember how much Germans and Italians contributed to this region of Brazil. As far as I know, Southern Brazil received the second largest number of immigrants from these countries, surpassed only by Northeastern USA. The time controls were exotic to say the least, starting with two rounds of 16 minutes, followed by two rounds of 31 minutes, and concluding with five rounds of 61 minutes. None of us could figure out the point of these odd time choices (why thirty…one minutes for example? 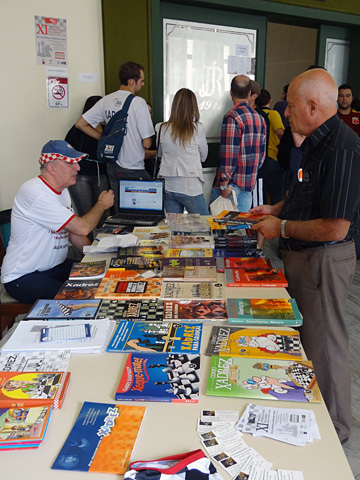 ), and it did not help that the organizer’s perpetual problems with punctuality had the first day start nearly two hours late, ending past nine at night. The next day started at 8:30 AM which combined with dinner, didn’t provide the players with much time to rest and settle in. On the upside, the arbiters were not provided with the means to arrive more than ten minutes before the official start, so the 8:30 start was more on paper than in practice. 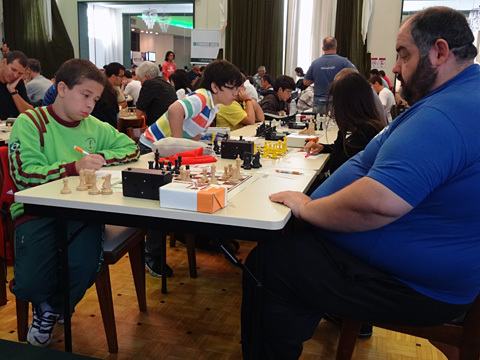 A number of other grandmasters joined the fray, such as Brazilian Giovanni Vescovi, Argentine Diego Flores, and others, bringing the total to ten, added to masters and a large number of children and players from all around. All in all, a field of 181 came to bump heads. Giovanni Vescovi, Carlos Born (kneeling). 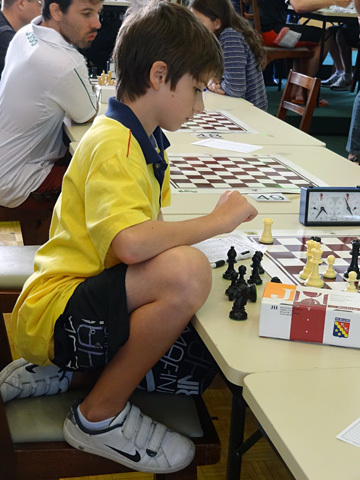 The actual structure of the place was very well-done, with a spacious playing area, a stage for the top two boards, screens to follow the action of the top two, and four webcams to see the players up close on a separate projector. 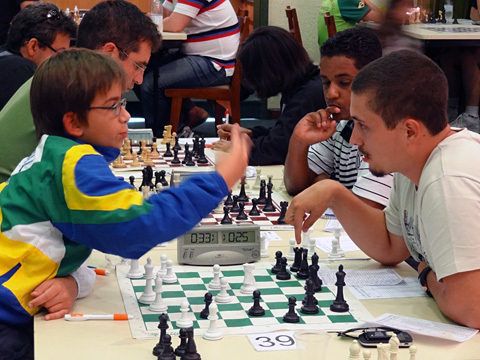 The Open ended in a resounding victory for Gilberto Milos, who avenged his second place in the invitational. A further curiosity of the Open was that draws were not permitted in the last two rounds for players in the top 50 boards. 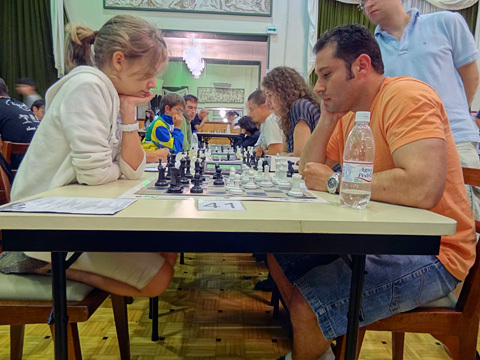 This was not a draconian version of the Sofia rules, but rather, in the event of a draw, the players would have to play an Armageddon blitz to break the tie. 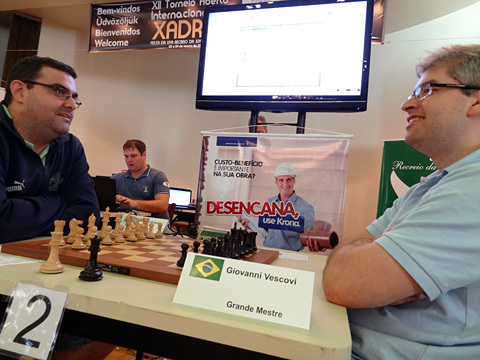 The game of the tournament was played in the fifth round betwen Andrés Rodriguez and Giovanni Vescovi. Rodriguez was the clear underdog, but you would never suspect it from the beautiful game he played. Two of the top places were decided this way in the last round. 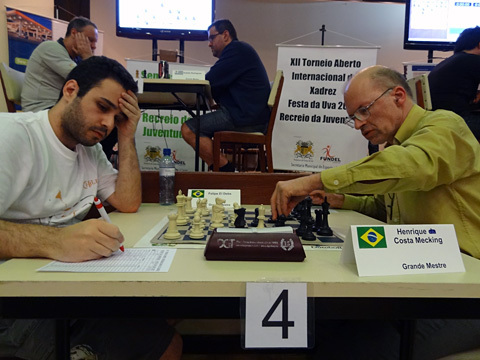 The first was between GM Diego Flores (2599) against IM Bernardo Roselli (2423). 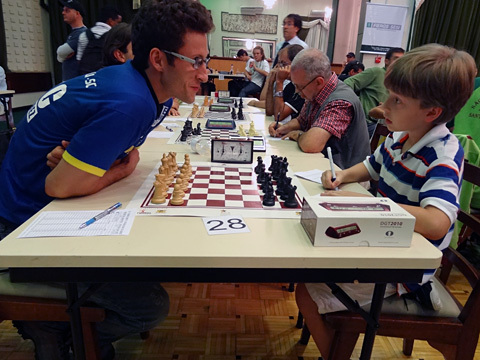 The next and most impacting was between GM Sandro Mareco (2579) on 7.0/8 against tournament leader GM Gilberto Milos (2593) with 7.5/8. Milos won the coin toss, and chose black. had to play an Armageddon blitz to decide the tournament. 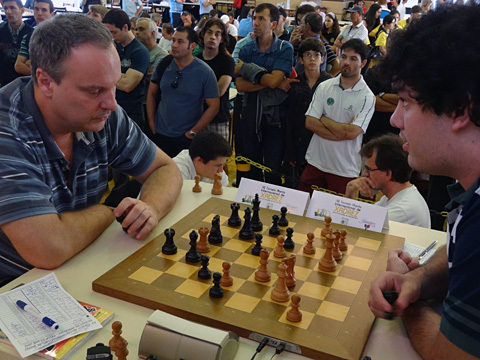 The Armageddon blitz between Gilberto Milos and Sandro Mareco to decide first. 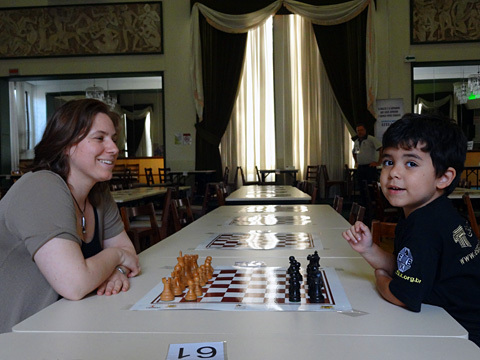 I’d like to take this chance to add that it was my first time meeting the great Hungarian player, and on top of her accessibility and friendliness, she can be summed up in a single word: she is a *star*. The asterisks are not excessive and fully deserved. Despite sometimes trying conditions, exhausting activities extending well into the night, and a very dense playing schedule, she still found the time to fit in an interview (between rounds at her suggestion), and always had time for a photograph or autograph for a fan, smiling throughout. 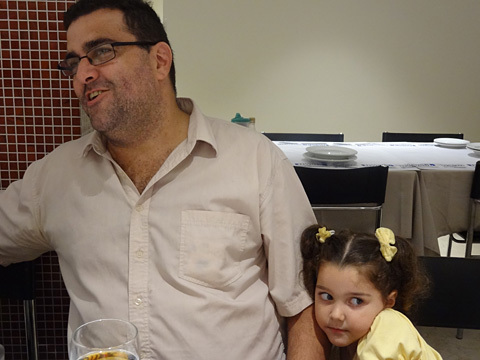 Carlos César Amorim, a highly respected and beloved chess teacher in Rio de Janeiro, died at the age of 43 in a freak accident. In an incident that a director would refuse to put in a movie as no one would believe it, a truck crashed into a light post where he was walking, a piece of which fell and struck him dead. Amorim, as we all called him, was a man who created a teaching unit called NEXAPA, extending its arms throughout Rio with students all over, and stood up to administrative corruption without fear of reprisals. 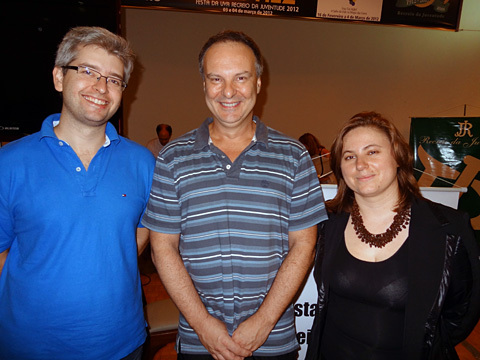 A hero in his dignity and character, and a great loss to the chess community. I dedicate this article to him, his family and his students. As promised, here are two videos from the invitational. 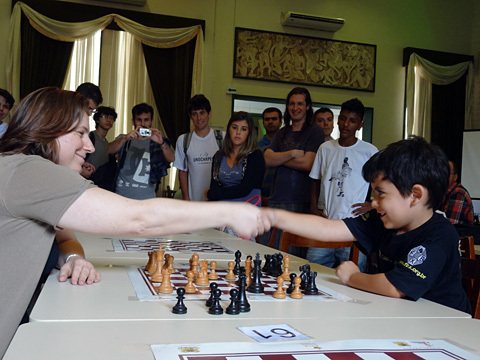 I will add a further rapid game between Judit Polgar and Henrique Mecking later in the day. were so impressive it deserved to be seen live even so. What would a tournament be without the time-honored book stand? 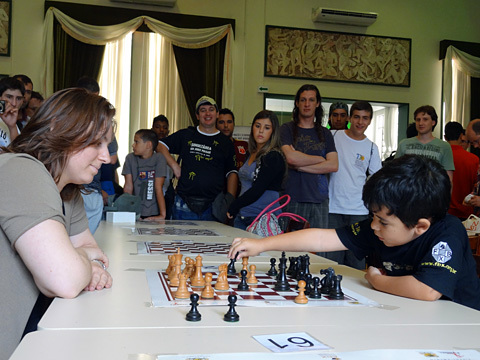 The tournament included many children such as Katherine Vescovi, Giovanni's daughter. leave an adult limping or bedridden. Still, this fellow, some may remember from the simul pictures, is only four years old. game against him, much to his delight... and that of the photographers! 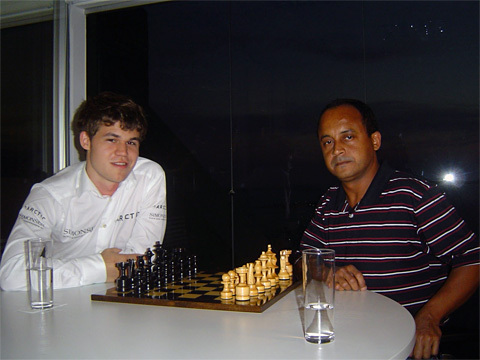 He might not be the strongest player, but he knew all the rules, and was a sharp fellow.